The Silent Salesmen promises to transform the way businesses promote their services and improve their bottom lines –– whether they are owner-run microbusinesses, mom-and-pop retail outlets, local service providers, or even independent salespeople. 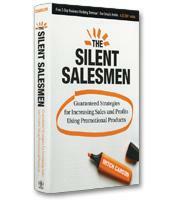 Throughout The Silent Salesmen: Guaranteed Strategies for Increasing Sales and Profits Using Promotional Products, marketing expert Mitch Carson professes the power of promotional products to turn any sales effort into a successful marketing campaign. While many people might mistakenly look at these products as mere doodads to schlep home from the latest trade show, these trinkets are actually part of a much more powerful strategy for getting the name of your product or service into the brains of your prospective customers. Carson’s book makes it clear that promotional items are not just for trade shows anymore. For example, he points out that promotional product incentives have the power to turn a $75 purchase into a $100 purchase when a free gift is involved. But, he writes, a promotional product is only a single piece in the greater puzzle of a comprehensive marketing plan. So, instead of simply making promotional items a one-off expenditure that simply enhances a sales visit or a promotional mailing, Carson explains that these strategic components of a promotion should be thoughtfully included in a much larger plan. To make promotional products work, he adds, they should accompany a thorough analysis of the organization’s current situation; a strengths, weaknesses, opportunities and threats (SWOT) analysis; an overview of competitors; measurable objectives; a well-developed marketing strategy; the plan’s action programs; and a realistic budget to make it all happen. A dozen relevant marketing topics — including advertising, trade show marketing, sales promotion, public relations and human resources — are inspected under the light of the principle of promotion. Carson advocates the benefits of direct-mail promotional products and incentives to highlight print advertising programs and amplify the power of first-time buyer programs, new products and services introductions, holiday promotions, and special offers. The Silent Salesmen offers marketing departments valuable tools for assessing their needs for another weapon in their marketing arsenal. As an expert on promotional products, Carson highlights the important ways all aspects of marketing can be touched by quality promotional items imprinted with a logo or message and how they can be a cost-effective way for a company to spread its brand name and image. Halfway through, Carson turns The Silent Salesmen into a hands-on workbook laying out a marketing plan from inception to completion. While asking questions that drive marketers to examine their motivations and goals, Carson helps them identify a target market through repeated written analysis and goal setting. Next, he helps companies identify and analyze their competitors by delving into their inherent differences and helping them find unique markets ripe for exploration. Within this workbook appears another useful tool for those thinking about starting their first sequential mailing campaign: detailed examples. Carson thankfully includes a complete set of sample letters to show how a sequential mailing can lure customers into long-term relationships. But the value and charm of The Silent Salesmen comes from more than its straightforward description of a step-by-step model of a thoughtful marketing plan. The last section goes beyond self-help development to dozens of real-life examples of successful promotional campaigns. These details offer marketers a multitude of ideas for promoting a product or service through an astounding variety of advertisements and mailers, which include many clever examples of relevant products that can add impact to any promotional campaign.